Virginity or Death! And Other Social and Political Issues of Our Time is another collection of political essays which Katha Pollitt originally wrote for The Nation – this time dating from 2001 to 2005. I decided to pick up this book because I absolutely loved Pollitt’s earlier essay collection, Reasonable Creatures. It wouldn’t be quite fair to say I didn’t enjoy this one as much, but it’s true that I didn’t get as much out of it, for one simple reason: it’s even more specifically American than her earlier work, and as a result I sometimes didn’t quite know what she was talking about. These essays were originally published as a weekly column, and so it's only natural that some of them comment on very specific happenings in American internal politics. Pollitt does give the reader references, but sometimes I simply lacked the cultural context. However, I very much enjoy learning about other countries and cultures, and I’m in fact going to count this book for the World Citizen challenge. Also, the essays that felt a bit alien to me were very much in the minority – quite a few of them deal with worldwide issues, or with issues that, while American, are relevant for the rest of the world too. Such was the case with my favourite essay, “Cold comfort.” It’s about women who were forced into prostitution in Japanese-occupied areas during WW2, a situation that despite all my WW2 reading I had no idea about.. Pollitt recommends the book Comfort Women: Sexual Slavery in the Japanese Military During World War II by Yoshimi Yoshiaka, which I’ll be sure to seek out. Katha Pollit is often sarcastic, unapologetic, and even a bit confrontational. I love her, though: her style, her irony, her sense of humour. I don’t think that her being so outspoken is at all a bad thing, but I do suspect that because of her tone, these essays, sensible and grounded though they are in my view, are not likely to appeal to anyone whose position is not at least somewhat similar to hers (which is to say, quite liberal). I’m okay with that, though – as someone who tends to be too apologetic, I admire people like Pollitt, who are not in the least afraid to speak their minds. Katha Pollitt always writes from a feminist perspective, but not just about specific women’s issues. Of course, the rationale behind her approach is that a feminist perspective is always relevant because any human issue will also affect women. Virginity or Death! covers topics like 9/11, the wars in Afghanistan and Iran, social justice, the 2004 American presidential elections, AIDS, childcare, reproductive rights, women’s rights in the Middle East, lbgtq rights, and the debunking of flawed studies that try to naturalize social differences between men and women – and let me just say I love how she manages to do this and still show an appreciation for science. 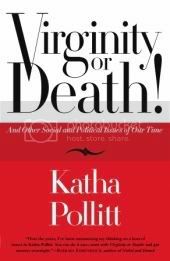 For me, reading Katha Pollitt is like talking to that one friend you always go to when you want to figure out how you feel about certain issues – even when you don’t completely agree, you know that the conversation will leave you feeling more enlightened. Despite the onslaught of negative media, and large audiences receptive to it, and despite the real-life opprobrium that can befall a woman perceived as uppity, promiscuous, or insufficiently shaven of leg, feminism persists because it fits the actual conditions in which women live. If women are educated, if they choose their own husbands (or choose to have none) and determine the size of their families, if they can support themselves or know that they could do so if they had to, then they are going to feel that they deserve the rights and privileges and respect society accords adult human beings, This is so, whether or not they call themselves feminists and even if they stay home taking care of children. How many children have these now-gray gentlemen produced in a lifetime of strenuous heterosexuality? None. But because they are men, nobody’s writing books about how they blew their lives, missed the brass ring, find life a downward spiral of serial girlfriends and work that’s lost its savor. We understand, when we think about men, that people often say they want one thing while making choices that over time show that they care more about something else, that circumstances get in the way of many of our wishes and that for many “have kids” occupies a place on the to-do list between “learn Italian” and “exercise”. Change the sexes, though, and the same story gets a different slant. Belkin’s idea of feminism is a caricature of the actual women’s movement. “The women’s movement was largely about grabbing a fair share of power—making equal money, standing at the helm in the macho realms of business and government and law,” she writes. But feminism was never about shoulder pads and power suits, or taking “only the shortest of maternity leaves,” or “becoming a man.” Feminism is about changing the ground rules, not just entering the game. Feminists, in fact, are the ones who first put forward the idea of balance between work and family—for both sexes—of a more humane and flexible and less hierarchical work place, of childcare as a task for both parents and for society as a whole. Belkin puts these ideas forward as the antidote to feminism, when they are, in fact, what feminism is. And here’s an interview with Katha Pollitt about this book. Right to the library website for me...I want to read this soooooo much! I love that last quote. Love it. And I just KNOW I'm going to love this book. Thanks, Nymeth! I'm not an essay person either, and I can't say I'm overly liberal, but I'm totally open to other viewpoints. I'm always curious to know every side of a story, so I can formulate informed opinions of my own. I also don't mind a little sass, which it sounds like she has! Hm, I am kind of in the mood for some political essays. This sounds good - and 2001-2005 was about when I was gaining political consciousness (sadly it was because our president was steady being awful), so I should enjoy these. Yay, fun! You're making me want to dive into the Victorians too! :D I did just start Ruth yesterday (on CD), and as soon as I finish Byatt, I'll be grabbing by Wilkie Collins Classic Circuit read! And I need to read North & South before it's due, so I might be having a classicsfest too. :) Is The Pillow Book long? It rather frightens me, lol, but if you end up enjoying it I'll give it a go! From all the reviews, I knew Julie & Julia the book wasn't for me at all, but the MOVIE is marvelous. :) What a neat opera commentary CD! I've been getting the straight-up operas from my library (the last one I listened to was Boris Gudonov-it was awesome! ), but a commentary would be even better. :) Since you enjoyed Better more than Complications, I can't wait to get to it!!! Every once in awhile I'll read essays and they are usually focused on some feminist issue. I love the quotes from the book, especially about how marriage for women is view differently than men. For some reason, if women do not get married they are "missing" something while with men it's a life choice. Wonderful point that I wish more girls realized and would look at. I met Pollit once at a conference in Washington D.C. and she came across just like her writing--brash and confident. Although she's physically very small, which was an interesting contrast, at least to me (I'm extremely tall). Melody, you are too kind! Sandy: I enjoy reading other viewpoints too! And lol, yes. She's got sass for sure. Eva: Would I be right to guess that you had several tabs open and somehow this comment ended up on the wrong window? :P I'm saying this because I've TOTALLY done that before, lol. Jeanne: How great that you met her! And it's interesting to know that she sounds just like her writing. I really should read what I write before I post it :S Then I wouldn't write "LOVE it for sure" twice in the same short paragraph. I normally don't do well with essays, but I think I might try this one out. It sounds like something that I'd scream "yes" at, you know? :p There's something about essays, particular political essays that always gives me a problem!! I don't know what it is..maybe they're just too dense for me? Who knows...but I really should try this one! I'm not really an essay person either, but I do like the sound of this one. If anything, political essays would be the ones I get the most out of. I've had Pollitt's last book on my TBR list since I read your other review!! One of these days I'll get to it!! I don't typically read books like this, but I like the fact that the author has strong opinions about these issues and since I am not really how close I fall into the liberal category, I think it would be interesting to see if I would agree with her views. Thanks for the insightful review on this one, it does sound really interesting. This book sounds really interesting, and it sort of makes me realize what a lazy reader I've been this year. I keep looking back over my list of reads for the year thinking, "Wow, very little of the memorable." This is the type of book I used to read all the time, and now that I'm overtaken by brain drain most of the time, I've let some of that more challenging or enlightening reading go. Maybe I'll try to amp up the quality for the rest of the year. Go me! And go you! Love your reviews, always! This sounds interesting, I admire people who are not afraid to speak thier minds too. Great review--three cheers for Katha Pollitt, three cheers for you! Will have to see if the library has this; it is definitely a "borrower". Thanks, Nymeth! Sounds interesting..I don't typically read essays because they take a bit longer for me to read but i often want to. And it's terrible about the comfort women, huh? This sounds interesting, I find essays enjoyable as long as they provoke thought (if not agreement!). The abuse of so called comfort women is shocking- if you're interested in reading more about it I'd recommend Fifty Years of Silence by Jan Ruff-O'Hearne, a memoir by an originally Dutch (now Australian) survivor of this. This sounds interesting and as usual, you've written an incredible review. I love this: "For me, reading Katha Pollitt is like talking to that one friend you always go to when you want to figure out how you feel about certain issues – even when you don’t completely agree, you know that the conversation will leave you feeling more enlightened." Chris, I think you would, yep :P These aren't dense at all either, promise! They're as readable as it gets. Stephanie, these are right up your alley! Zibilee: She's very outspoken, but I kept thinking that someone's got to be, you know? Andi: I hope you enjoy it if you decide to pick it up! I go through phases where I don't really read much that broadens my horizons either. ds, I hope you find it! Alice, to each their own! Sarah: That was definitely the case with these essays. And thank you for the recommendation!